Home Blog What Are The Common Reasons For Garage Door Damage? Given the extent of their daily use, garage doors are probably one of the most heavily used parts of any property. It’s no surprise that they get suffer natural wear and tear after years of use. Asides from usual wear, there are other factors which can bring about damage. We explain more below! 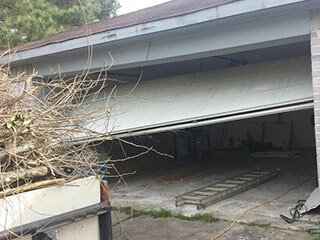 Hurricanes, earthquakes, floods and even strong winds can result in a damaged garage door. Depending on the extent of the damage, a simple repair or part replacement may suffice These natural calamities may cause simple dents on the door or totally displace it from its hinges - the one reality with weather is that it can be hard to predict. There are preventative measures you can take though like weatherproofing your door and adding seals - if you live in a hurricane prone area, you may wish to consider a specifically hurricane-proofed or reinforced door. We can't avoid the fact that accidents can happen, like backing our car into the garage door. This kind of damage can be extreme or fairly minor. If the impact is particularly hard, your springs may be negatively affected which may well cause bigger problems for your system. If you notice damage to your springs or significant wear and tear, you should replace them before an actual breakdown. Every once in a while, it helps to inspect your door system, lubricate any moving, metal parts and check the tracks for debris and clogging. In particular, you should check your springs on a regular basis as these components can be dangerous if they break unexpectedly. These are just some of the things that cause damage to the door. To avoid a costly repair or breakdown in the future, the best thing to do is to keep it in good condition. Proper maintenance carried out by professionals will help to maximize the lifespan of your system as a whole.